The rapid growth of technology means the ability to collect vast amounts of data and support high rate online transactions. As the volume and velocity of data increases, extracting meaningful insight in a timely manner or supporting online transactions has become more complex. Opportunities are being missed and effort is being wasted. To compete, businesses in the 21st century are demanding the tools to derive true value from their data. This version of the Lenovo Database Configuration for Microsoft SQL Server Data Warehouse Fast Track portfolio uses the cost-effective 1U System ThinkSystem SR630 server that is combined with Lenovo PM863a Enterprise Entry SATA SSDs to address data warehouse requirements up to 9 TB in capacity. With this solution Lenovo is the industry’s first company offering a Microsoft certified database solution featuring Microsoft SQL Server 2017 Standard Edition software. This version of the Lenovo Database Configuration for Microsoft SQL Server DWFT uses the high performance 2U Lenovo ThinkSystem SR650 server to support data warehouse requirements up to 50 TB in capacity. This high capacity and performance were achieved by employing the ThinkSystem SR650 architecture combined with high end components like the Intel P4510 NVMe solid state drives. With this solution Lenovo is the industry’s first company offering an Intel Select Solution for a Microsoft SQL Server based data warehouse application. It is also an industry first Microsoft certified database solution featuring Microsoft SQL Server 2017 Enterprise Edition software deployed on Microsoft Windows Server 2019. 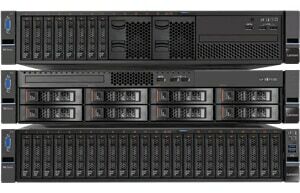 Lenovo offers a Microsoft SQL Server DWFT solution featuring the highly available Lenovo ThinkSystem SN550 compute node deployed in the Lenovo Flex System Enterprise chassis. For storage, this solution also features the Lenovo ThinkSystem DS6200 SAN which is designed for I/O intensive applications. Enabled with Microsoft SQL Server 2017, this solution improves time-to-value for data warehouse analytics applications with a scalable architecture. This version of the Lenovo Database Configuration for Microsoft SQL Server DWFT uses the high performance Lenovo ThinkSystem SR950 server (4-socket configuration) combined with Lenovo PX04PMC 4TB NVMe Mainstream Flash Adapters to support data warehouse requirements up to 90 TB in capacity. With this solution Lenovo extends its portfolio of Microsoft certified database solutions featuring Microsoft SQL Server 2017 Enterprise Edition software. Through the Intel Select Solution program, Lenovo offers a growing portfolio of high availability Microsoft SQL Server OLTP solutions featuring the robust ThinkSystem SR630 and SR650 servers. These transactional database offerings combine high-performance and cost effective server platforms with Microsoft SQL Server software. These solutions are based on the Intel Select Solution specifications and performance results have been verified by Intel. To deliver the uptime performance businesses demand in today’s competitive operational environment, these solutions are deployed in two server high availability configurations. Simplified evaluation. Intel Select Solutions are tightly specified in terms of hardware and software components to eliminate guesswork and speed decision-making. Fast and easy deployment. With pre-defined settings and rigorous system-wide tuning, Intel Select Solutions are designed to increase efficiency in the IT testing process, speed time to service delivery, and increase confidence in solution performance. Workload-optimized performance. The Intel Select Solution configurations offered by Lenovo are jointly designed by Lenovo and Intel to deliver performance at a specified workload threshold and are built on the latest Intel architecture foundations. 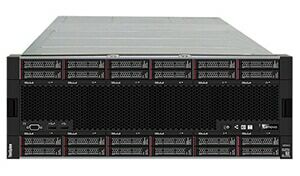 Lenovo offers a Microsoft SQL Server OLTP solution featuring the highly available Lenovo ThinkSystem SN550 compute node deployed in the Lenovo Flex System Enterprise chassis. For storage, this solution also features the Lenovo ThinkSystem DS6200 SAN which is designed for I/O intensive applications. Enabled with Microsoft SQL Server 2016, this solution improves time-to-value for transactional needs with a new scalable architecture to solve SQL database transactional needs up to 50,000 batch requests per second. Higher performance and scalability: Start small and scale databases as your needs grow, but without the concessions of traditional infrastructure. Improved availability: Keep key applications protected and running with frequent, easy-to-restore backups and affordable, simple disaster recovery. Reduced operational complexity: Leverage simple, consumer-grade management, VM-centric operations and unprecedented insight into application and storage performance. This version of the Lenovo Database Configuration for Microsoft SQL Server DWFT uses the high performance Lenovo ThinkSystem SR950 server (4-socket configuration) combined with the Intel P4510 NVMe solid state drives to support high capacity data warehouse requirements. With this solution Lenovo extends its portfolio of Microsoft certified database solutions featuring Microsoft SQL Server 2017 Enterprise Edition software. The Lenovo Database Validated Design for Oracle 12c on SR650 is a database offering developed by combining the Lenovo ThinkSystem SR650 2-socket rack server with the ThinkSystem DS6200 storage array. The resulting pre-tested validated design enables faster deployment times, storage scalability and features the infrastructure elements required for an Oracle certified 12c RAC (Real Application Cluster) database deployment. In addition to redundant servers and a storage system, this architecture features data networking and storage switching elements. Lenovo has developed a highly available database offering by combining the Lenovo ThinkSystem SR850 4-socket rack server with the ThinkSystem DM5000 storage array. The resulting pre-tested validated design enables faster deployment times, storage scalability and features the infrastructure elements required for an Oracle certified 12c RAC (Real Application Cluster) database deployment. In addition to redundant servers and a storage system, this architecture features data networking and storage switching elements. This solution starts at 2 servers and can scale with Oracle RAC for availability and capacity. By employing a Lenovo high availability server this solution enables businesses to deploy a high performance and highly reliable Oracle 12c RAC database. You need new ways to accelerate decision making and gain insights into key trends locked in your data. With the Lenovo ThinkSystem and ThinkAgile solutions for SAP® HANA®, your organization will be able to instantly access, model, and analyze all of your SAP business transactional and analytical data from virtually any data source in real time. Choose from a preconfigured solution or a custom Tailored Datacenter Integration (TDI) solution. Scale-out and effectively protect your data with integrated high-availability and synchronous disaster-recovery capabilities using IBM® Spectrum Scale, or leverage high availability features in SUSE Linux Enterprise Server for SAP Applications or Red Hat Enterprise Linux. Additionally, VMware® virtualization technology can be used for optimizing deployment and management of your Lenovo server application environment. New SAP HANA solutions for ThinkAgile HX and ThinkAgile VX help speed deployment, simplify management and deliver dramatic data-center efficiency for SAP HANA workloads in Nutanix and VMware hyperconverged clusters, respectively. It comes fully backed by Lenovo Professional Services so that you can rely on Lenovo’s deep SAP HANA expertise to deploy and manage SAP HANA with confidence. Lenovo Enterprise Solution Services and qualified Lenovo Business Partners offer fast implementation services and ongoing maintenance of your SAP® HANA® solution. 24x7 managed services are available from Lenovo Enterprise Solutions Services. The Lenovo Solution for SAP HANA®, Edge edition, advanced version for small and mid-sized enterprises (SME) combines the speed of in-memory processing with the ability to analyze massive amounts of data from every aspect of your organization – enabling small and mid-sized companies to eliminate time lag between business events and decisions. Built on Lenovo offerings that rank #1 in customer reliability and satisfaction1, and developed in close collaboration with SAP, the Lenovo Solution for SAP HANA, Edge edition, advanced version provides unique capability for SAP HANA® applications to drive enterprise-critical insights in real time. 1According to ITIC and TBR. Lenovo System solutions for SAP Business One® with SAP® HANA® enable smaller businesses and subsidiaries to take advantage of in-memory computing technology with an affordable in-memory analytics platform. SAP NetWeaver® Business Warehouse Accelerator (BWA) provides a complete picture of your business from diverse data sources. It extends the reach of traditional SAP NetWeaver Business Warehouse environments and enables near real-time analytics for those not ready to move to SAP® HANA®. Lenovo provides a choice of server solutions for SAP NetWeaver BWA depending on the size of your data and your scalability needs. Lenovo Services offer fast implementation services and on-going maintenance of your SAP NetWeaver BWA solution. 24x7 managed services are also available. Choose from a preconfigured solution or a custom Tailored Datacenter Integration (TDI) solution. Scale-up with the new SAP HANA solution for ThinkSystem SR950 utilizing the latest Intel® Optane persistent memory, or Scale-out and effectively protect your data with integrated high-availability and synchronous disaster-recovery capabilities using IBM® Spectrum Scale, or leverage high availability features in SUSE Linux Enterprise Server for SAP Applications or Red Hat Enterprise Linux. Additionally, VMware® virtualization technology can be used for optimizing deployment and management of your Lenovo server application environment. SAP HANA solutions for ThinkAgile HX and ThinkAgile VX help speed deployment, simplify management and deliver dramatic data-center efficiency for SAP HANA workloads in Nutanix and VMware hyperconverged clusters, respectively. It comes fully backed by Lenovo Professional Services so that you can rely on Lenovo’s deep SAP HANA expertise to deploy and manage SAP HANA with confidence. With the exponential growth of data from multiple new sources - for example, mobile, social, and web – new tools and technologies are needed to gather, analyze and visualize data in order to extract powerful insights from this data. In addition to traditional structured data optimized for relational database management systems, these new sources of data are typically unstructured or semi-structured, meaning that schemas to harness the data must be flexible, distributed for horizontal scaling, and on preferably low-cost industry-standard servers.